Brought up in an all-girls high school, Sachi is a natural airhead who has been single for her whole life. During her first match-making party, she meets a boy called Yuki-chan, and suddenly her history of being boyfriendless has come to an end...?! 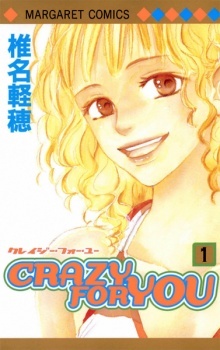 Crazy for You has been published digitally in English by VIZ Media under the VIZ Select imprint since August 25, 2015. Remember when you first started to write stories in school? There was this guidline given by your teacher about where exactly should the climax be and how exactly should you bulid it? Crazy For You is like that guidline for tangled relationships. This is not a bad thing. All this means is the plot is simple. But what it does do is make the plot very, very cliche. You are introduced to five characters who you soon find out become intwined in complicated love relationships. By the time volume 1 is finished, it is quite apparent where the plot is headed. Still, as this is as basic as a tangled relationship can get, anyone who enjoys such stories should put this manga high on their priority. What a guidline doesn't constrict is the emotions that the characters portray. This is where Crazy For You does trascend over lots of other shoujo manga. This doesn't mean that the character personalities of the manga aren't cliche (because Sachi is still that naive girl we've seen so many times), instead the emotions that the characters have and express because of their love are REAL. We understand exactly what they feel when they cry, laugh or feel their heart is being torn apart. We understand why they choose to hold the emotions in or let them out. I know that this doesn't sound that impressive but many stories out there just can't use emotions to create a character that doesn't seem distant. On the other hand, the characters in this manga express feelings exactly like how we express ours and we can pick people we know that are similar to them. Their emotions bring us through the story. Crazy for You is a fun read. But as it really is quite cliche, the climax points are quite minimized. Instead, in depth emotions is what makes the story, even though slightly unbelievable at times, relatable to us and we end up liking and feeling the need to support the characters in the story. Crazy for you is a typical story of a girl falling deeply with a troubled guy?! Cliche yes!? However, this story has a certain charm to it!? it made me laugh, cry and frustrated at the same!? I read the story at one go!? The characters development is somewhat slow but i think it is a perfect pace for this particular storyline!? The characters go through trials of love, hatred, jealously and JUST DRAMA ALL AROUND!? The main character is amazing she is strong-willed, average looking, cute and does what she wants?! Even though she may seem weak, stupid and dense at times but that is the charm of the character I think?! The best thing about her is her brutal honesty about how she feels!? She falls in love with a guy who is in love with another girl?! it may sound hard at first but gradually all of the characters around her start to change because of her!? Read it because it is just a wonderful story!? the guys of the story may agitate at some times but at the end of the story everything comes to the right place!? You will experience different emotions (thats what i felt). I bought all volumes of this series at one go when I realised it was by the same mangaka as Kimi ni Todoke, which is a series I've fallen madly in love with. Never before have I regretted a purchase this much. Everything about Crazy for You, with the exception of the art, was a disappointment. We follow Sachi, a cheerful and somewhat naive girl who has never had a boyfriend. One time, she goes out on a group date, meets Yuki and falls madly in love. Her friends try to warn her that he'll just break her heart, but she chooses to spend more time with him. Eventually, the love lives of Sachi, Yuki and some of their friends become intertwined, lots of tears are shed, but everything may or may not have a happy ending. Sachi is an okay protagonist. She's cute and sweet and cries a lot, but she's got inner strength, and she's able to analyse her situation rationally and do the right thing, even if it's painful. The main problem for me was the male lead, Yuki. At no point in the series did I understand why Sachi was so head over the heels in love with him. I saw no chemistry between them whatsoever, and Yuki acted like a thoughtless jerk throughout almost the entire series. There was nothing interesting or likeable about him. In addition to Sachi and Yuki, there are three other characters who are important to the story. Akemi is a friend of Sachi's who's dating Yuhei, who happens to be Yuki's friend. Then there's also Eiji, another friend of Yuki's. In my opinion, Yuhei was the best character in the series. He was endearing and funny, but he had his serious moments, too. Akemi irritated me because it was impossible to understand what her motives for her actions were, but she improved a lot towards the end. And Eiji mostly frustrated me because it was clear what his role in the love pentagon would be, and watching him struggle against the inevitable wasn't fun. I love Karuho Shiina's art style. It's adorable and full of personality. I particularly like the female characters and the joy that radiates from their faces in happy scenes. A dull and frustrating series with boring characters but beautiful art. If you want to give this mangaka a chance, skip this and read Kimi ni Todoke which has the great art but does everything else a million times better. "...don't you dare look back!" Crazy For you reminded me of Peach Girl, but in this one, there weren't any mean/bad characters that try to hurt each other. No, this one felt more real to me because the one doing the hurting are people you love, your own best friends. It's easy to engulf yourself in it when all the characters seem human, they mess up and their choices hurt people they love and they repent. Loving someone for years and then getting together to realize that you have both changed and there is no going back, no matter how much you want to. It's about growing and realizing that we're all just looking for the same thing. That's the main thing I learned in Crazy For You. That love doesn't change, people do. Characters: They all have their faults. Juk, was more complex, he was so closed in that he didn't let anyone near him, emotionally, more back story on him would have been great, to understand him more. Eij (Akahoshi)i,was my favorite, he was behind the scenes. He wanted her to be happy, even Juki said i, "Akahoshi, will treasure you for sure." Akemi, she didn't smile at all, barely, you knew she was unhappy. And the reader could tell who she loved, really loved, before she realized it herself. The Art was nice, it was average to me, don't know what to compare it to. "When you delete all the 'buts' and 'howevers' the original most genuine thought would appear."